The Floating Stars quilt pattern may be one of the easiest quilts you'll ever make. The Floating Stars quilt block pattern was originally written for a scrappy quilt block exchange, but can be used for any project you wish to sew. Each set of fabrics will make nine blocks that finish at 4" square. Cut additional sets to make the total number of blocks required for the quilt size you want to make. If you're not sure about the best size for a bed be sure to read about mattress sizes and comparisons. 3" background squares with 1-3/4" squares for tips, finishes at 2-1/2"
3-1/2" background squares with 2" squares for tips, finishes at 3"
4" background squares with 2-1/4" squares for tips, finishes at 3-1/2"
5-1/2" background squares with 3" squares for tips, finishes at 5"
6-1/2" background squares with 3-1/2" squares for tips, finishes at 6"
Each Floating Star square has a quick-pieced triangle in opposite corners. Stars emerge when the finished blocks are sewn together. Stars aren't the only possibility for these little triangle-tipped squares. They could also be used to sew an X's and O's quilt, even though lights and darks are typically reversed in that layout. Draw a diagonal line on the reverse side of each dark star tip square. The line should stretch from one corner to the opposite corner. Align the square with a corner of the background block, edges matched exactly and right sides together. Press to help the fabrics "stick" together or secure with a straight pin placed away from the marked line. Sew a seam on the marked line. Remove from the machine and repeat on the opposite side of the square. Press to set the seams. Cut away the excess triangles remaining past the seam. Leave an approximate 1/4" seam allowance. Press seam allowances towards the background (towards the corner if the background is very light). That's it. Simple... right? Now sew more Floating Stars and use chain piecing to make them go together even faster. When you've made all the blocks you need, place them on a design wall or any flat surface. Place blocks side by side in rows. Step back and evaluate the quilt's layout. Should some very dark or very light quilt blocks be rearranged to sprinkle them throughout the quilt, or to make blocks have a more consistent appearance? Do you like the way colors are either balanced or clustered? Leave the room for a bit then return. Do you still like the layout? Keep playing with the quilt until you're happy with the way the quilt blocks are arranged. Don't get into too much of a hurry to sew the Floating Stars together. Sleep on it and take another look when you wake up. Press new seam allowances in adjoining rows in opposite directions. Sew the rows together, butting seams to match block edges. Use half blocks to add a patchwork border to the quilt and give Floating Stars a more finished appearance along its outer edges. Cut a 2-1/2" x 4-1/2" background rectangle for each star block on the quilt's perimeter. Cut the same number of 2-1/2" dark squares. Make sure your quilt blocks are arranged as above, with dark triangles in the upper right and lower left corners of the quilt. Count the number of blocks in the top row. Gather one rectangle and one square for each of those blocks. Sew the square to the bottom left edge of the rectangle, using the same method squares were sewn to blocks. Complete the entire set, press, and trim. Sew all together lengthwise into a long border as shown in the illustration. Repeat to make another identical border set. Sew one strip to the top of the quilt and the other to the bottom. You'll need to reverse the bottom strip end-to-end to make it match. Sew to the quilt with the same method used to attach butted borders. Count the blocks on each remaining side of the quilt. Use the squares and rectangles to construct a border set for each side, with one difference: sew a square to the lower right corner of each rectangle to make units that are mirror images of the first. Sew the units into two border strips. Refer to the drawing. Sew a 2-1/2" background square to the end of each pieced border. Press. Sew the new borders to the sides of the quilt, positioning them to complete the outer stars. You may want to add more borders to the quilt. Border width is up to you, but a width of about 2/3 - 3/4 the width of a block usually works well. 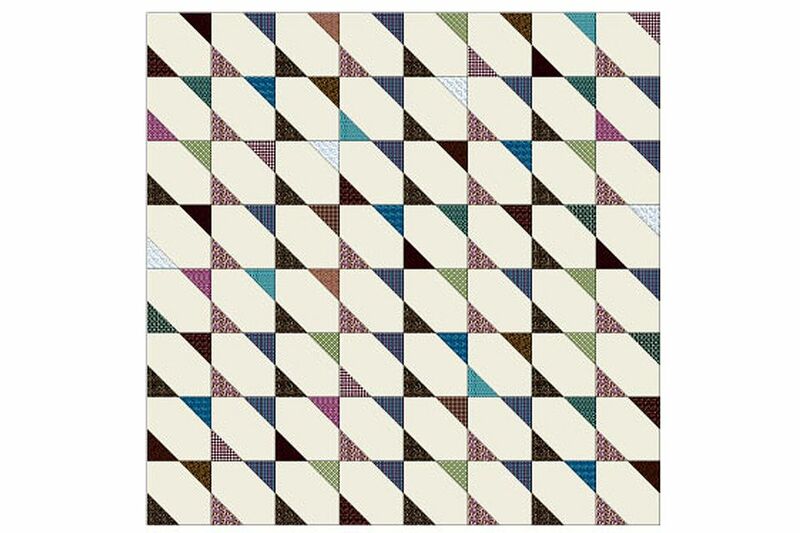 Experiment with the width and number of borders to see what looks best with your quilt. When you're ready, measure and sew the borders and finish the quilt as desired by marking it for quilting if necessary and then sandwiching the quilt top with batting and backing. Baste the layers together and quilt by hand or by machine. Remove the excess batting and backing and sew easy mitered binding around the edges of the quilt.